JSLs: Deep Diving Invert Friends in Need! In case you haven't heard form Deep Sea News or Pharyngula (or my own post at Eclectic Echoes), the Johanson Sea Link manned submersibles have been slated for retirement and their tender ship the R/V Seward Johnson put up for sale. Kevin and I hope you will join us in signing a petition to the powers that be in Florida to reconsider this decision and seek every opportunity find funding for them as a vital asset for science and the state. The JSL submersibles (Johnson Sea Link I and Johnson Sea Link II) are unique manned submersibles that were designed and built at Harbor Branch Oceanographic Institute in the 1970's. JSL I was launched in 1971 and JSL II launched in 1975. The submersibles were built around a 6' diameter, 5.25" thick acrylic sphere that serves as the cockpit and main viewing area, where the pilot and chief dive scientist sit. In the sphere they have a stunning 270+ degree field of view. The aft cabin was originally designed to carry lockout divers (used to survey the USS Monitor, but was converted to a secondary observation cabin which can carry a second crew member and scientist. While these were both launched over 30 years ago, they are among the youngest manned submersibles in the US science fleet, and they are still quite capable, having logged over 9000 dives during the years and having quite a busy schedule for the remaining year. But Why Should Invertebrates (and invert lovers) Care? In 1975 JSL I discovered the Oculina Bank. An incredible deep water coral reef off of Florida. The JSL crews have returned there frequently and their work led to designation of the Oculina Bank Habitat Area of Particular Concern and the Oculina Bank Expermental Closed Area. Further work by scientists on JSL missions have enumerated the ecology of these reefs including hundreds of invert species which hide among the coral branches and spaces. 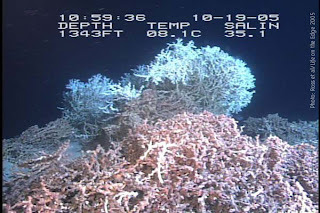 Mapping and exploration by JSL led to protection on sections of Lophelia reefs. And that's just a start from someone who is not affiliated with the Sea Link program at HBOI, I wonder how much more they could provide. Of course there are many non-invertebrate reasons to care as well. There are only 16 manned research submersibles in operation around the world, 8 in the United States. These two, with their unique capabilities would be quite a loss. Whats more the outreach and future explorer excitment value of the JSL's is huge. To put it in NASA geek terms, ROV's are the Delta-V orbital launch vehicles (e.g. "rocket") and manned submersibles such as Alvin and the JSL's are the Space Shuttles of underwater exploration. So head over to Deep Sea News and read the first hand accounts of the JSLs from Dr. M and Kevin. While you're at it check out Southern Fried Scientist's question "Manned or Unmanned?" 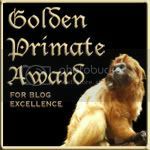 and a bit of my response to that question can be found in my post at Eclectic Echoes. But no matter what else you do, please read the petition and sign it if you agree with us that these vehicles are simply too valuable to retire. Then reward yourself for doing a good thing with some short movies of the JSLs' and the R/V Seward Johnson. 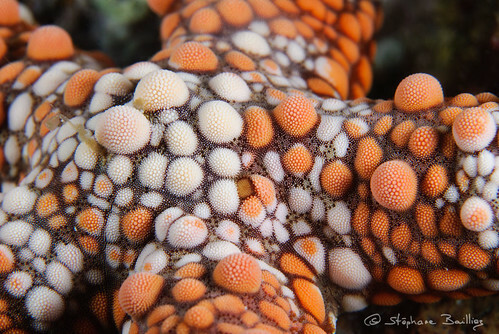 Warty sea star, originally uploaded by sbailliez. Now this is a cool looking sea star! What purpose do they serve, if any? Why are some distended from the body and others not? Do the warts have pedicellariae ? 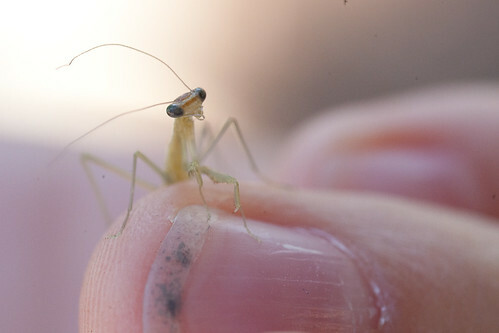 We found an ootheca recently, and brought it in to watch the hatching of 85+ tiny (less than 1cm long) mantids. They have now taken up residence in the garden hopefully keeping the early spring aphids at bay. Johann's newest pet, originally uploaded by eclectic echoes. It's been a bit quieter around here than Kevin and I prefer, but now the finals are all done and I can finally say "I can has cheezburger wit dat?" Did you know there are 198 199 invertebrates listed under the Endangered Species Act? Yep, inverts make up 34% of the 575 animals protected under ESA. But is this good or bad that inverts are underrepresented here?? Care to guess how many of those 198 199 are molluscs? Today, May 15th is Endangered Species Day, and the the net was all atwitter with postings and tweets about endangered species. 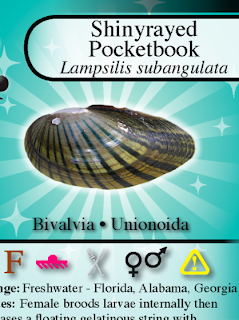 I just got done with the prototype for an outreach product that includes some of those endangered molluscs so I tweeted out the Shinyrayed Pocketbook (Lampsilis subangulata) a member of that marvelous group of freshwater mussels, the Unionidae. If you recall from our earlier posting, this is the group of freshwater bivalves that has the habit of spitting its spawn into the face of an unsuspecting fish. The spawn are technically a form of larvae unique to these mussels called the glochidia and for some reason all my vertebrate loving friends seem to think that the whole "spewing spawn in your face" technique is rather disturbing. The young molluscs that are now in the face and mouth of the hapless fish attach to the its gills and encyst there. They feed on the blood in the gills until they are ready to drop to the sediments and metamorphose into a full adult form. The shiney-rayed pocketbook is found in Alabama, Florida and Georgia, mainly in the Chattahoochie and Flint rivers. In its most recent review it was assessed as endangered with a recovery priority of 5 (high threat and low potential for recovery). The good news though is that from 2003 to 2007 the range of the Shiney-rayed Pocketbook did extend into more of the river than it had been in recent years. The shiney-rayed pocketbook handles the details of reproduction and larval distribution a little differently than our last Unionoida. Our last fresh water mollusc, the Snuffbox, lures a fish in with it's mantle flaps which look like a small fish. When the fish attacks the lure, the snuffbox springs its trap, catching the logperch's head between it's valves. It then uses it's mantle to smother the fish for a few moments. When it releases the smothering hold on the fish a little, it also releases it's glochidia which is has been brooding in the shell. The fish gasps for water (air) and gets water and glochidia. The shiney-ray takes another very interesting tack at larval distribution. Its females also brood the young until they reach the glochidia stage then release them to parasitise largemouth bass (Micropterus salmoides) and spotted bass (M. punctatus). The season for releasing glochidia will be begin in just a few weeks, late May through August.) The females, create a superconglutinate, a group of large packets (conglutiates) of glochidia attached to what appears to be a long transparent mucus rope. The superconglutinate strongly resembles a small fish, which lures in larger predatory fish. When a larger fish attacks the superconglutinate the mass ruptures and glochidia are freed to attach to the gills of the fish. The glochidia parasitize a fish host until they are ready (able?) to metamorphose into juvenile mussels and settle to the substrate in sandy or muddy, slow moving regions. It is thought that the main purpose of the parasitic stage is not actually for nutrition and growth, but for transportation and distribution since the larvae would be unable to fight even a weak river flow to hold position or fight upstream, but attached to a fishes gills they can expand upstream or at least maintain position. This is borne out to some degree by recent expansion of L. subangulata up current in some locations. Of course a video is highly warranted here, so courtesy of M.C. Barnhart, I give you the close cousin of L. subangulata showig off her superconglutinate. The orange-nacre mucket (Lampsilis perovalis, the species in the video, is one of only 2-3 other species known to create a superconglutinate. New Circus of the Spineless and Carnival of the Blue! Loads of buggy fun at The Birder's Lounge, host of this month's edition of the Circus of the Spineless. Go on now, scurry away and read it. Send your spineless submissions for next month's carnival to Bug Girl! Check out the CotS homepage for more updates and info. Don't forget to check out the Carnival of the Blue too! Hosted this month by Sea Notes, a blog from the Monterey Bay Aquarium. Send next month's submissions to Mark Powell at Blogfish.